AAA Mid Atlantic held a press conference in College Park on August 17th at the speed camera on Metzerott Road, claiming that the camera "flunks" basic standards for accuracy and placement. AAA pointed to the fact that the camera does not comply with SHA guidelines because it is placed in a 'speed transition zone', located 100 yards after a 10mph drop in the speed limit, and in the Westbound direction the drivers can clearly see the 40mph sign in front of them by the time they are passing the camera enforcing a 30mph limit. In addition, AAA pointed to the case of a driver who received a citation from a college park camera who had a device electronically records the speed of his car, which indicated he was traveling far slower than the speed recorded on the citation and was not speeding at the time of the violation. The driver's citation was dismissed in court on a technicality, with the judge refusing to rule one way or the other on the accuracy of the camera. AAA has sometimes publicly argued against specific speed camera locations which are 'cash cows'. However AAA is not an anti-speed camera organization. Their revenue generating business does not come from public advocacy but from their travel agency and insurance businesses. As such AAA is not serving any particular 'agenda' or financial interest by arguing against these particular cameras, as Optotraffic and their clients (who DO have an agenda to make money from the cameras) might like the public to believe. 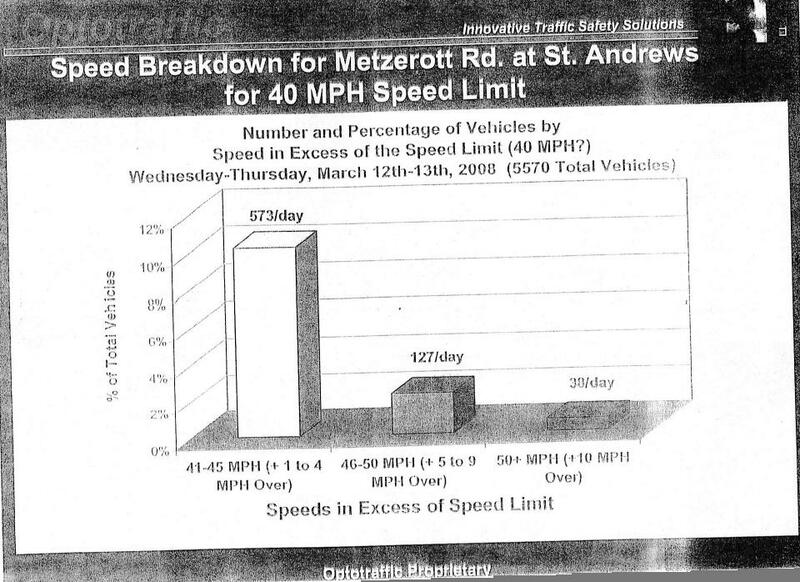 In fact when statewide speed cameras were being discussed in the Maryland General Assembly in 2009 AAA testified that they supported the legislation, only arguing that more restrictions be added to the law. Most of the restrictions AAA requested in their testimony were either not implemented or have been circumvented by local governments. College Park issued over 60,000 citations last year worth approximately $2.4million. Under their contract with Optotraffic 40% of the revenue goes to Optotraffic. A prohibitions on paying companies based on the number of tickets issued has been ignored and successfully circumvented by College Park and most other municipalities in the state simply by not using the word "operating" to describe what the contractors do, regardless of how much control they have over the devices, their maintenance, placement, and calibration. Because College Park does not maintain its own police force, the have contracted Prince George's County police officers to rubber stamp electronically review and approve citations using Optotraffic provided software. Optotraffic cameras are currently used in at least 14 municipalities in Maryland. The reports of errors by this type of camera are widespread, have arisen in different areas independently for some time. Errors have been previously reported by Optotraffic cameras in the mainstream press in Forest Heights and Brentwood a year ago. Citizens in the town of Cheverly independently raised accuracy issues about that town's cameras, confronting the town council in a public hearing (Cheverly's response to the complaints was later plagiarized by Forest Heights). Citizens have independently written to the Gazette about the errors. We've also reported on such errors in College Park and New Carrolton, and have received other reports of errors from Berwynn Heights and Riverdale Park as well. We were contacted by 2 other individuals claiming errors from College Park cameras who did not wish to go public. Most people who receive questionable citations probably assume their only options are the two stated on the citation: pay the ticket (meaning the complain will never be heard) or take a full day off work and challenge it in court. In fact many people do challenge citations in court claiming inaccurate speeds, but typically this does not come to the attention of either the press or elected officials. Most such defendants typically have no legal experience or knowledge about the systems with which to build a defense. Speed camera cases are heard in a proceeding where the burden of proof has been explicitly lowered under Maryland law below that of any other type of violation (ie the verdict is based on whether the judge believes it is 51% likely the car was exceeding the speed limit, not 'beyond reasonable doubt'), and evidence may legally be admitted against defendants 'without authentication' by authorities (according to the wording of state law). StopBigBrotherMD previous reported on the possible mechanisms of errors from these types of cameras, including a video demonstration with a scale model (our belief is that the problem is a design flaw, rather than a 'calibration' issue with one or two specific cameras). We've also demonstrated how the certification and testing of Optotraffic cameras used in some jurisdictions may be insufficient to ensure accuracy. StopBigBrotherMD.org had previously obtained copies of documents from the City of College park pertaining to this specific camera location. The permit application from the city of college park showed different boundaries for the 30mph zone in the eastbound direction, with the transition from 40mph to 30 placed substantially farther to the east than the camera is currently placed. 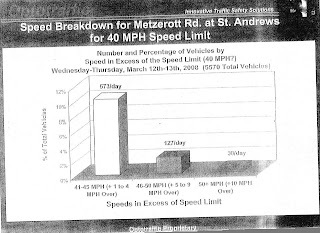 When StopBigBrotherMD.org asked College Park officials about this their response was that the documents in their permit application showing the 40mph limit in that section of road were "an error", even though the "error" was repeated at least 4 times in the comments we received and were supported by legacy Google StreetView images. The documents included a traffic survey which showed the enormous impact placing a camera near a 10mph drop in the speed limit and enforcing a 30mph vs a 40mph limit might have on the number of tickets issued. Prince George's county has approved a contract with Optotraffic and will begin deploying 72 Optotraffic cameras on August 22, creating a large number of new school zones never previously designated or marked as such for speed camera use.